Supergirl is the story of Naomi, a 9 year old orthodox Jewish girl. However, she's not your average 9 year old. She's the strongest 9 year old girl in the world! 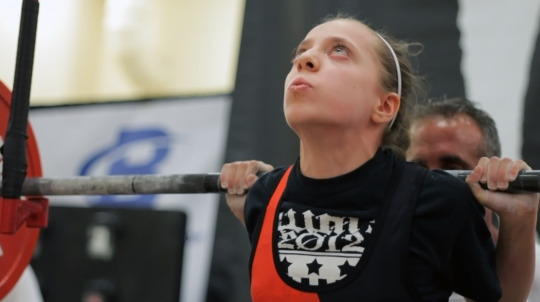 She receives world records for deadlifting in her age group, 265lbs at age 9! Weighing 95 pounds! Squating 205lbs at age 9! Powerlifting is a male dominated sport, but that didn't stop her. The cyber bullying, didn't stop her. Not even some later health issues stopped her. Naomi feels like super girl when she puts on her workout clothes and lifts. She feels cool. She feels empowered. She doesn't feel cool in every day life. She feels like "supergirl" is her alter ego. It was nice to see a documentary about such a strong female. Since I love fitness, watching her lift these really heavy weights was unbelievable! It was an inspiring movie to see, I especially recommend it for young girls! but don't start to lift heavy without supervision! SUPERGIRL plays November 13th at DOC NYC. For tickets and more information go here.